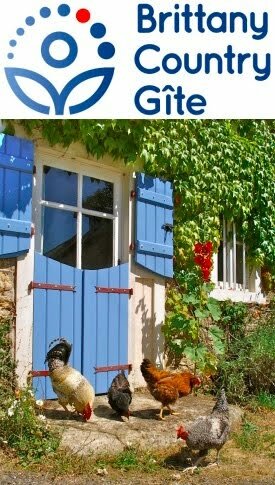 If you are a regular reader of this blog, you’ll know that, rather than being a slick ‘how to’ guide to permaculture full of achievement and success, it’s actually a traveller’s tale along a stony road full of mistakes and ‘no shows’, with, it has to be said, the odd moment of glory. This is just such a rare moment. We’ve attempted something for the first time … and, amazingly, it has worked. 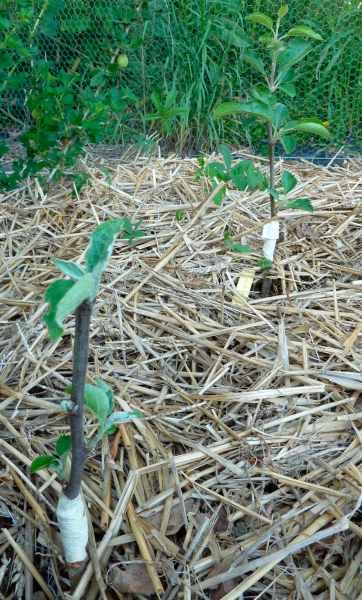 We grafted hardwood cuttings onto existing fruit trees and rootstocks and, after a tantalising delay, they’ve all sprouted big healthy leaves. I would say that the large majority of all fruit trees that you’ll come across are grafted, that’s to say that it’s not a tree that’s grown from seed but rather two trees, in the parlance of stolen cars, “cut and shut”. The top bit gives you the fruit you want and the rootstock determines the terminal size of the tree, thus you can have a Granny Smith apple that is a dwarf tree, requiring a stake all it’s life to support it, or a Granny Smith that grows to a full-size tree, which you’ll be climbing with a ladder to harvest it. 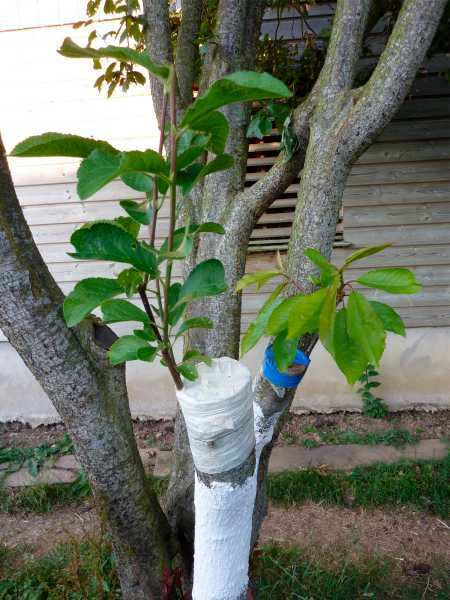 In December last year, we took hardwood cuttings from a Mirabelle (sweet yellow plum) and a tasty yellow cherry that we have (no idea of its name) then wrapped them in a plastic bag and stored them in the fridge. 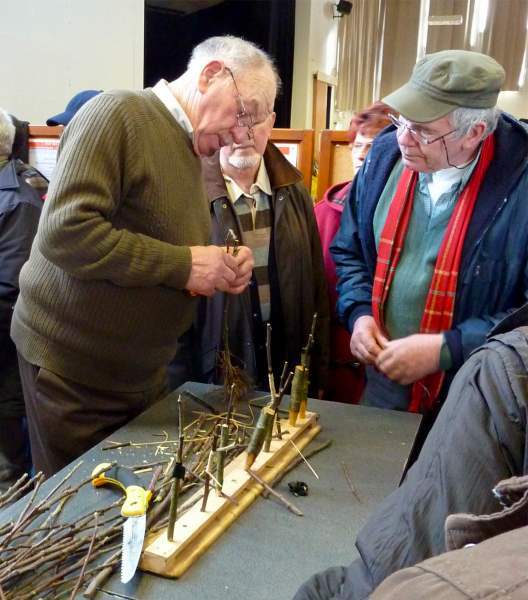 In February, we went to a local event run by a club, passionate about their local apples, called “Mordus de la Pomme”. 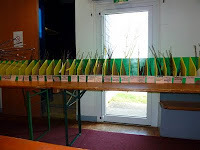 We were able to buy hardwood cuttings from an astonishing range of local apples along with porte-greffes (rootstocks). 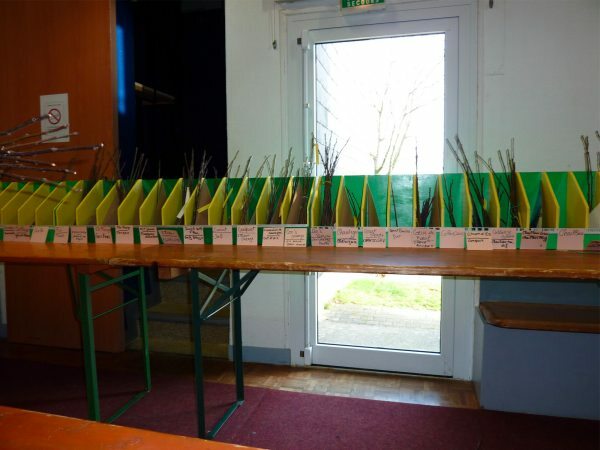 There were thick catalogues of apple varieties and plenty of posters and diagrams to explain what to do along with enthusiasts demonstrating grafting techniques. 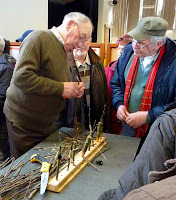 We bought a couple of dwarfing rootstocks and a couple of ‘twigs’ of Reinette d’Armorique and Rouget de Dol. 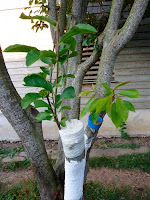 The rootstocks were planted in a pot of earth and the cuttings stood upright in a pot of moist sand, both of them being put in a shady place, so as not to dry out. Like goes with like (stones or seeds) so cherries and plums are interchangeable, as are peaches and almonds but apples go with crab apples and pears on quince rootstocks. 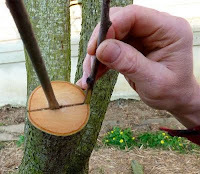 In March, we used the cleft graft technique for all the grafts, cutting off a branch, or chopping the rootstock off square, then creating a cleft with a froe or pocket knife (as appropriate). 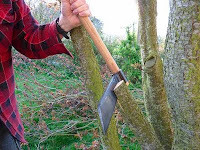 Taking care of your fingers, two decisive cuts with a sharp knife form a tapered wedge at the end of the graft (scion). A flat-bladed screwdriver holds the cleft open while one positions the scion. The idea is to line up the vascular cambia (Google it: I haven’t got the space to explain everything!) which is rather precise. The old guy at the fête de greffes had a great trick. 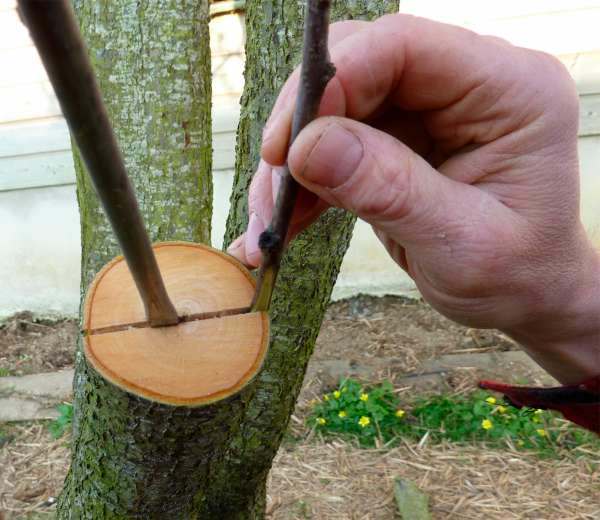 If you angle the scion relative to the branch into which it’s being inserted, he reasoned, at least one part must be in the correct position. That’s what we did and, despite taking some time and having us both concerned, ALL the grafts have taken. Proud permaculturalists are we. 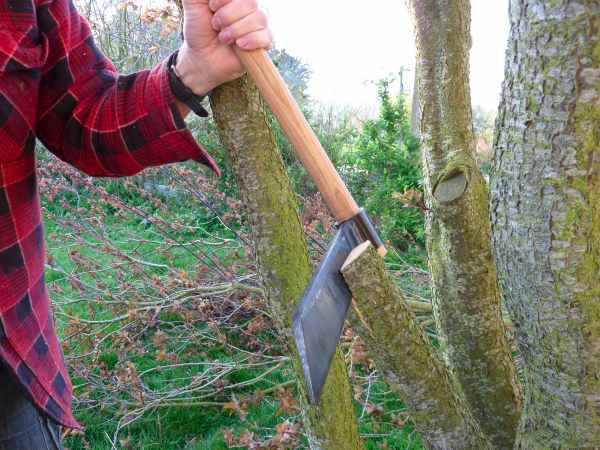 By the way, you don't need to buy a special knife, nor grafting pliers, nor grafting wax, nor special tape (strips of polythene and and masking tape work fine) so put away your cash while you make your first attempts. Brilliant! 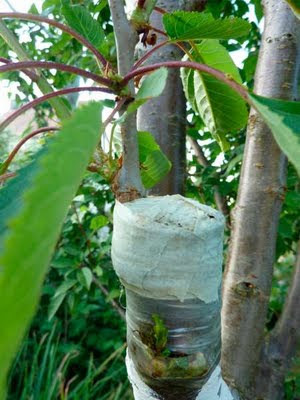 Best explanation on the mysteries of grafting I have seen!